There are some foods I enjoy seasonally, like pumpkin anything in the fall, okra in the summer. But there are other foods I enjoy year round. Most people think of ice cream as a summer treat, but I find myself enjoying it on the coldest day of the year. I’ll gladly heat up my kitchen making soup on a summer day. With soups I just enjoy being able to eat the leftovers! So despite the warm temperatures, while the rest of the world was likely grilling, on Memorial Day I made soup! Just like Annie, the minute I saw the ingredients in this soup I knew I’d like it. I’m glad I was able to use some of the homemade chicken stock I made a while back. It helped make some more room in my tiny freezer. If I’d had red peppers on hand I would of gladly roasted them myself. I love the smell of red peppers roasting in the oven. This soup was a great combo of tasty, healthy ingredients. I love black beans & roasted red peppers. The Boy and I both agreed though, when making this again, I’ll opt for pulled chicken. Whether it’s from a rotisserie or baked by me, I think we would prefer the texture and flavor of chicken prepared that way. Also, I opted for Muir Glen’s Organic Fire Roasted Tomatoes to give it some extra heat. In a large Dutch oven or stockpot, heat 1 tablespoon olive oil over medium-high heat. Add the onion to the pot and saute until tender, about 5 minutes. Add the garlic and cook 1 minute more. 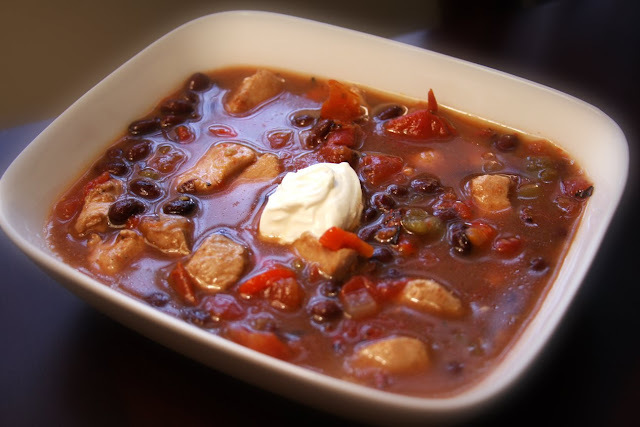 Mix in the black beans, diced tomatoes, red peppers, green chiles, chicken broth, cumin, and cayenne. Add chicken to the pot. Bring the mixture to a boil, then reduce the heat to a simmer. Allow to simmer uncovered for 45 minutes. When finished, remove from the heat, season with salt and pepper and stir in fresh cilantro. Looks really tasty! 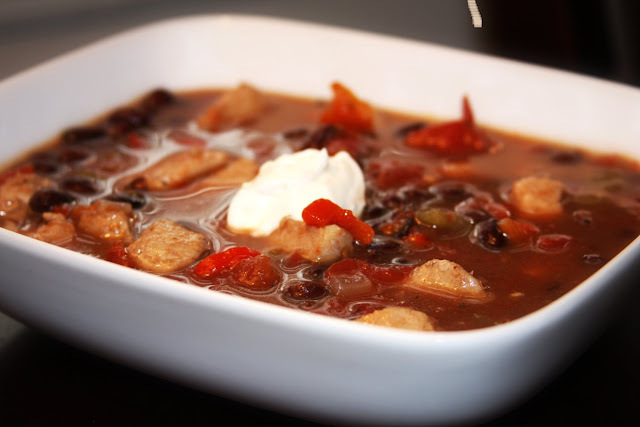 I love black bean soups/stews! That first picture is awesome! Is that with the flash? I don’t even like bean/chili type soups but that picture makes me want some! This looks wonderful! I’m with you on the soup. I made picadillo last week and it was 95 out! This looks so good. 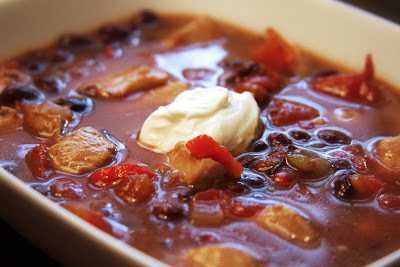 my hubby would love this he’s been asking for black bean stew. What a delicious looking soup! Soup is one of my favorite comfort foods and I enjoy it year round too! I love black beans, this looks great! I love beans and that sour cream on the top is so tantalizing! Glad you liked it! I should make this again soon.